So that was the best of what I read in 2012 but what about the rest? Well, I didn’t read many books this year; according to my hapzard notes only 33, though I suspect I’ve missed some off my list. This is lower than most other years I can remember and I also failed to finish far more books than usual, either through carelessness (Swamplandia! by Karen Russell left on a train) or disinterest (Wildwood by Colin Meloy, for example). I did, however, manage to achieve one of my two reading resolutions for 2012. Firstly the one I failed to met though. I planned to read and review on this blog one science fiction novel written by a woman each month, the same resolution I made in 2011 when I achieved ten out of twelve. This year I read four from my list and only managed to write about one: Gwyneth Jones’s excellent Spirit. This is in the context of a year when I reviewed far few novels (six) than any year since I started reviewing. This did includenew science fiction novels by Moira Young and EJ Swift though and two thirds of the books I reviewed were by women. More positively, I planned to achieve gender parity in my reading and I did. By my count, 18 of the books I read this year were by women which is 52.9%, massively above my previous annual average of 16.9%. It was a very interesting experiment to structure my reading this way and one I feel I’ve benefitted from. I am not going to consciously repeat it this year but I am going to monitor it and see if it has altered my reading patterns. This post was inspired by Victoria Hoyle’s excellent post on Eve’s Alexandria about the agony and ecstacy of stretching yourself as a reader. So I’d like to take half a leaf out of her book when it comes to a resolution for this year: I’d like to read more, to read more broadly, to read more deeply, to write about more of what I’ve read. We shall see. Niall Harrison has just completed his second SF Count for Strange Horizons, his survey of coverage of speculative fiction by women. As with last year, it is bad news for women. It is also bad news for me as reviews editor of Vector. The percentage of books by women in the BSFA Review has gone down from 25.6% in 2010 to 18.8% in 2011. Similarly, the percentage of women reviewing for Vector was gone down from 29.8% in 2010 to 25.5% in 2011 (the actual number of individual reviewers has remained the same). Having presided over a decline in what were already weak numbers has been a wake up call for me because for all the fine words I made after last year’s SF Count, I’ve taken my eye off the ball. Which is exactly how these things come to pass; not through malice but the privilege of inattention, disengagement from an issue that harms people other than me. I have taken steps to improve things this year so I hope BSFA members will see an improvement and I also hope they will hold me to account. Overall since 2001, 22.1% of the books I’ve reviewed have been by women and I’ve only achieved gender parity in 2006 and 2011 (years when I haven’t published many reviews). Most of my reviews have appeared in SF Site (15.8%) and Strange Horizons (23.5%) but I have been closest to parity in Vector (32.4%). It is perhaps a positive sign that for the first five years I was reviewing I averaged 16.7% whereas for the second five years I averaged 25.9%. Whilst I’ve written a lot about books on my own sites, I’ve excluded blog reviews from these stats as I only started formally considering these as reviews last year and I’m not going back and counting all the informal ones prior to that. However, if the fromal blog reviews were included it would put me up to 26.8% overall and 70% for 2011. This is mostly due to starting the year of reading women last year which shows that even a modest effort like this can have a substantial impact. I make that 16.9% for the seven years overall (as an aside, fully a tenth of that total is Pat Barker). I stopped recording these figures in August 2010 when I was on 20.6%. 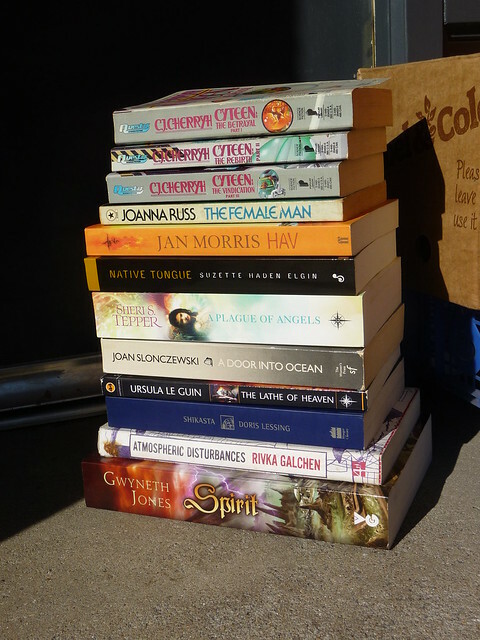 This was when I became an Arthur C Clarke judge and was no longer able to write about most of what I was reading in public; given the well-known gender imbalance in British science fiction publishing, the total figures for 2010 and 2011 are unlikely to be any better than previous and quite conceivably worse. When I stopped being a judge and the responsibility of silence was lifted from my shoulders, I started tallying the figures again. As it happens, I have managed to accidentally achieve gender parity with the eight books I’ve read by choice so far this year. My plan for the rest of 2012 is make a conscious decision to continue this by deliberately reading one book by a woman for every book I read by a man. After the massacre, Bibi was given a choice: become the General’s concubine, or Lady Nef’s servant. She chose to be a servant and they took here away, from the mediaeval isolation of Cymru to the labyrinthine Great House in Kirgiz; and then to teeming Baykonur, the Enclosed City, Gateway to the Stars. Bibi had no desire to leave Earth. She certainly had no wish to try the Buonarotti Transit, non-duration ‘starflight’ that could leave you criminally insane, or turned inside out; or both. But circumstances forced Nef and the General to take her with them to Sigurt’s World: on a diplomatic mission that was to end in mayhem and inexplicable betrayal. In the terrible prison of Fenmu, Nef and Bibi found each other again. The great lady, before she died, bequeathed to Bibi her exalted level of Access to the Systems – and the 4-Space co-ordinates of a secret treasure. There is another paragraph after that but those 150 words manage to cover the first four acts of the novel and take us up to page 255 of 472. What is remarkable about this synopsis is not its casual disregard for its notoriously spoiler-sensitive readership (see current Gollancz publicity director on spoilers) but the fact it barely scratches the surface of this extraordinary novel. Spirit contains more in a single book than most modern science fiction trilogies manage and is easily one of the half dozen best SF novels published this century. I took no notes whilst reading it and as such I cannot really do justice to the novel so what follows is not a review but some thoughts. Bibi is short for Gwibiwr – Welsh for wanderer or voyager – and Spirit is the story of her rise and fall and rise again. Orphaned at ten by an assault on her home by General Yu, she becomes a servant in his household for his wife, Lady Nef. If this initially seems like slavery, it soon becomes clear it is more akin to adoption. The first act sees Bibi grows to adulthood in this house, the irregularly sized chapters advancing us forward in time and the gaps between them unknown. This is a standard literary technique but also fits with a recurring theme of the novel that time is fluid. So too is gender and Jones presents a fascinating future society hundreds of years in the future following the alien invasion catalogued in her earlier Aleutian trilogy consisting of White Queen (1991), North Wind (1994) and Phoenix Café (1997). As with The Count Of Monte Cristo, I am working from a position of ignorance with respect to these novels – I read North Wind when I was 14 but can remember nothing of it – and, whilst knowledge of them is not necessary to fall in love with Spirit, I can’t help thinking greater understanding of the Aleutians and the Gender Wars and the rest of the future history would have enriched the experience. It is against this backdrop and on the brink of adulthood that Bibi stumbles upon a conspiracy that sees the whole household being banished from Earth. Every race they met on their way through the Core had a star drive based on a different theory. All those theories worked, even when they ruled out one another’s basic assumptions. You could travel between the stars, it began to seem, by assuming anything. There is something fearless about this position and that is a word that encapsulates Jones’s novel. After spending some time on Speranza and adapting to a whole new social order, Bibi and the household are sent on a diplomatic mission to Sigurt’s World and the novel transitions to a wonderfully Banksian planetary romance. 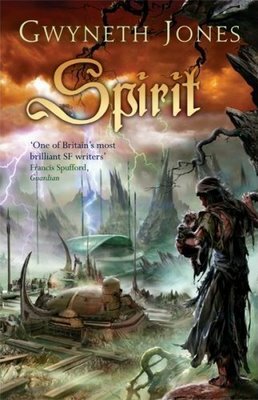 Basically, if you love Iain Banks but have been disappointed by his output for the last decade or so, Spirit is the book for you. The mission goes wrong in a bit of alien politicking that is again a novel in itself; in the immediate aftermath of the debacle, the General betrays Lady Nef to save himself and casual condemns Bibi on the grounds that she is the only person who would now this. Unaware of their shared fate, the pair are imprisoned and forgotten in caves on the planet’s moon and, in the face of decades of isolation and despair, Bibi’s soul disintegrates. It is a huge tonal shift and a remorselessly bleak section but Bibi emerges from it, taking the reader with her on each painful step to recovering. When through her efforts she is re-united with Lady Nef, the path is clear for her escape but it remains a hard row to hoe. But here the faithfulness of the copy to its original begins to waver. For a start, the way that Dumas accelerated both the action and the tension throughout this portion of his novel is largely absent from Spirit, and the occasional adventures inserted into the story seem largely artificial additions, not really part of the overall plot… But it is a novel whose strength wanes the longer it goes on. If she had stayed closer to the colour and drama of the original, it might have ended up being even better. Ultimately, that is what makes Spirit not just a great novel but a book I took to my heart (even if these random scribbles don’t really convey that). Last year I set myself the challenge of reading and writing about one science fiction novel written by a woman each month. If any one would like to join me in reading any of those books in those particular months, I would welcome the conversation. And I think we are still due a discussion of Spirit over at Torque Control, aren’t we? In addition, I will be trying to read and review more books by women in general and my review of Blood Red Road by Moira Young is forthcoming at Strange Horizons. But it isn’t just about what I review. As reviews editor for the BSFA, I also have a big say in what other people review and the books that are covered in Vector. Niall Harrison will be repeating the SF count again this year and, as part of this, I’ve tallied up the coverage of books by men and women in Vector. The ratio is very poor. So it is all very well talking the talk but I’ve clearly taken my eye off the ball and I need to be much more proactive in 2012 in ensuring speculative fiction by women is visible in Vector. Octavia E Butler is a renowned science fiction novelist but I’ve accidentally managed to choose the only one of her novels which isn’t SF for this series of posts on science fiction novels written by women. Whoops. I picked Kindred because it appeared to be the most popular of her novels but, as with so many of the titles I’ve selected for the series, it isn’t in print in the UK. Originally published in 1979, my copy is the 1988 Bluestreak edition (“a paperback series of innovative literary writing, featuring works by women of all colors”) from Beacon Press, featuring an introduction from Robert Crossley (which unfortunately hasn’t been updated since it was originally published). The thing that misled me into thinking Kindred was science fiction is the fact it is a time travel story. More accurately, Dana, a young black American women living in Seventies California, finds herself flung back in time to the Deep South at the beginning of the Nineteenth Century. Crossley remarks, perhaps unnecessarily, that “Butler is silent on the mechanics of time travel.” (p.x) That is understandable but it soon becomes clear Butler isn’t even interested in using magic to tell a science fictional story. Dana finds herself pulled back in time because a young white boy, Rufus, is drowning. She saves his life only to find herself threatened by his father. This is enough to snap her back to the present. Here, for reasons of pure plot expediency, she finds mere seconds have passed rather than minutes. This allows Butler to yank Dana back to the past every time Rufus is in danger but whilst he ages, Dana does not. My wife read the novel earlier in the year and warned me that it as extremely boring. Perhaps that coloured my own reading but I certainly found it a tedious slog. Butler begins her book with the words: “I lost my arm on my last trip. My left arm.” (p.1) It is a great first line, the matter of fact repetition makes the sentence and promises tension and revelation. Unfortunately Butler does everything she can to strip this away, to close down her text as much as possible. The second time Dana is forced to save the remarkably accident prone Rufus, she realises that he is her great-great-grandfather. This familial connection supposedly sets up a moral dilemma because it means she is tied to him and must be complicit in his sins to ensure her own survival but since this contrived ‘what if’ could never be it lacks any force. Instead, Dana is locked into a cycle of psychological and physical torture from which there can be no escape due to authorial fiat. Crossley describes the power Rufus exerts as “an irresistible psychohistorical force, not a feat of engineering.” (p.x) It is a similar psychic power that propels Connie through time in Marge Piercy’s Woman On The Verge Of Time, published three years earlier. There are important differences, however. To start with, Connie has at least some agency; she does not have control but she has some influence. Dana has nothing, she is tossed around at random. More importantly, Connie is moving forwards through time which allows Piercy to compare Seventies America to a utopian potential future. Since Dana moves backwards, however, it is only possible to compare two specific periods in the history of the United States. This closes down a huge amount of potential. Part of the problem is that compared to a straight historical novel, the timeslip removes a lot of the work (and hence engagement) for the reader. Instead of learning the world ourselves, piecing together its differences to our own time, we have Dana standing in the way, relaying it to us through her own filter. “I never realised how easily people could be trained to accept slavery.” (p.101) If that is the case then Dana isn’t very bright; more likely, Butler isn’t treating the reader with enough respect. On page 188, Dana goes back to the future once more and I gave up on the book. Recommendations for better Butler novels would be welcomed in the comments.